The ROSETTA space probe and its lander module, Philae, are finally working as a team again! Whilst Philae had to take a little time off, ROSETTA circled the comet 67P/Churyumov-Gerasimenko (Tschuri) at a safe distance – with eleven scientific precision instruments on board. 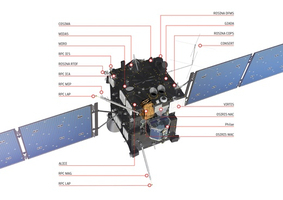 COSIMA, for example, is an instrument that collects dust particles blown up from the comet for further analysis. 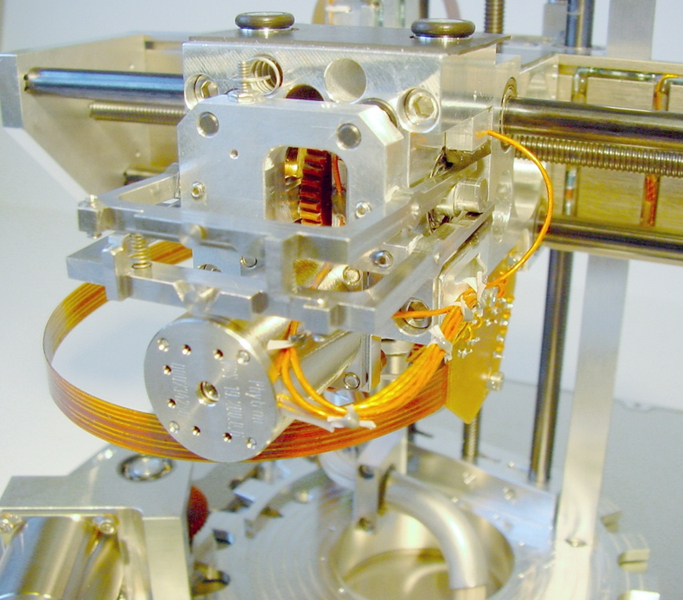 Space-qualified hybrid stepper motors developed by the Bavarian high-tech company Phytron carry out precision work within COSIMA. 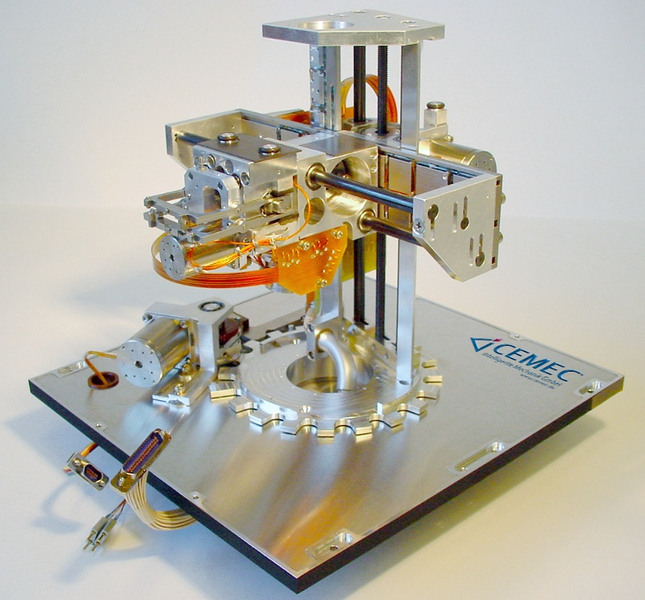 COSIMA stands for "COmetary Secondary Ion Mass Analyser" and is made up of a series of individual instruments, such as a secondary ion mass spectrometer and a four-axis handling robot (the Target Manipulation Unit; TMU). 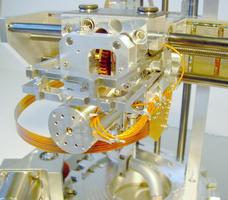 The secondary ion mass spectrometer studies the dust surrounding the comet and analyses the collected dust particles. These are transported by the handling robot within COSIMA. The particular challenge consists of moving the dust probe using a lightweight mechanism over distances of ten centimetres from instrument to instrument and then aligning it with absolute precision. The motors can move the dust particles to be examined in 0.8 µm steps and thus not only ensure optimum conditions for analysis but also increase the resolution of the microscope camera by taking slightly offset images. "This is an incredible achievement for this structure", says Dr Martin Hilchenbach, project manager for the COSIMA experiment at the Max Planck Institute for Solar System Research. 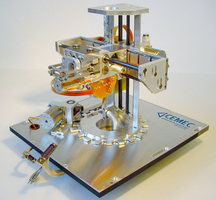 The contract for developing the handling robot was awarded to CEMEC GmbH near Nuremberg in October 1998. 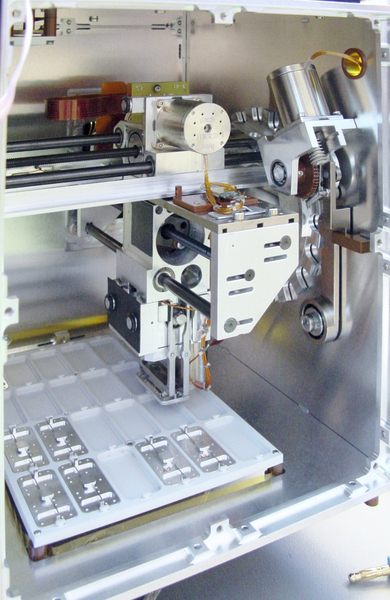 The four-axis mechanism is driven by the Phytron two-phase hybrid stepper motors, which are designed for ultra-high vacuums and for use in space. "It was important for us to have someone alongside us who was able to supply a motor tested for use in space", saaid Martin Schwab, Managing Director of CEMEC GmbH, when describing the award of the contract. "In addition to the performance characteristics, the decisive criteria for us were the special bearings in the motors, precise geometrics, optimised windings, the choice of the right materials and the manufacture of individual mechanical interfaces. 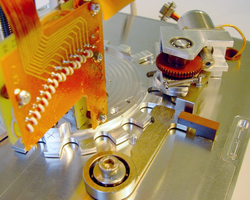 The outgassing of the motors, the function tests and product release meant that it was possible for us to start using the drives in our mechanism immediately. Phytron thus made a major contribution to the successful use of the TMU." Because of the robust operating principle and simple control combined with its high-precision positioning capabilities, the Phytron stepper motors are also ideal even without feedback electronics for demanding applications. Martin Hilchenbach adds: "The stepper motors are still working very reliably and highly precisely, even after ten years in space. In 2007, which was still in the approach phase, all 24 targets were reached and photographed. We have been working on the comet since July 2014. The device is now working four times a week, for up to 16 hours at a time!" One satisfying result is that sodium and magnesium have already been found in the dust particles that have been analysed.